BrisSynBio researchers are supported the dedicated high performance computing cluster, BlueGem. 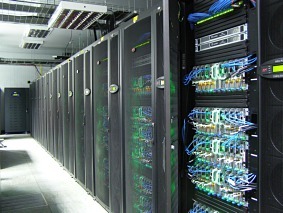 This is in addition to the BlueCrystal supercomputers that are provided to all researchers at Bristol via the Advanced Computing Research Centre. These clusters are housed together and provide login (ssh) access to thousands of compute cores and over one hundred graphics processors. The clusters also contain high performance and high speed filesystems that support data-intensive simulations and database applications. Dedicated, resilient and high performance disk space supplied by the Research Data Storage Facility. This provides long-term (multi-decade) data storage and remote access and publishing via unique Document Object Identifiers (DOIs). A graphics suite comprising high performance Linux desktops with the latest nVidia Quadro graphics processors. These come with nVidia 3D Vision Pro active 3D displays and 3D glasses, allowing for immersive three-dimensional molecular visualisation. A graphics room with an additional high performance Linux desktop with nVidia Quadro graphics processor, connected to an 80" wall-mounted passive 3D display. This provides a highly immersive three-dimensional high-resolution view of molecular structures. All of this equipment is available to BrisSynBio researchers using a "free at the point of use" model.